When half the class is absent that Wednesday before Thanksgiving, what's a teacher to do? I always use this day for a relaxed lesson that emphasizes giving thanks for what we have. 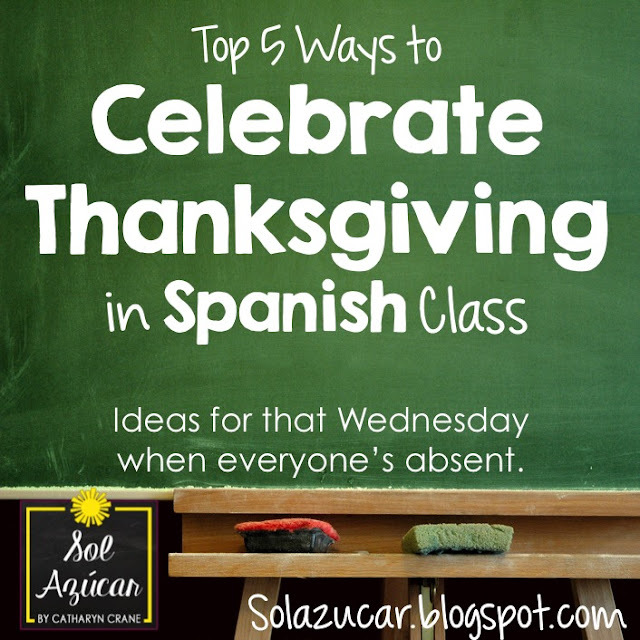 Here are my top 5 ways to celebrate Thanksgiving in Spanish Class. These can be adapted for any level of middle or high school Spanish class! Practice real world Spanish interpersonal writing skills while showing some thanks with a nota de agradecimiento for a favorite teacher. Students will be able to write a simple thank you note in Spanish to express their gratitude to a favorite teacher of their choice. I collect all the thank you notes at the end of the day and leave them in teachers' mailboxes as a special treat. Explore this beautifully complicated song while practicing interpretive communication skills and learning about the legendary Chilean musician and activist Violeta Parra. Students will be able to interpret the Spanish song Gracias a la Vida. 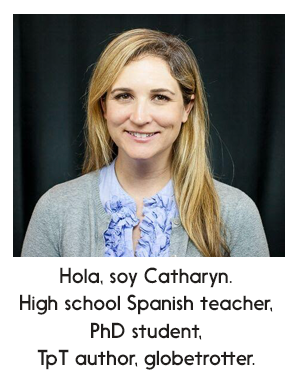 Students will be able to connect the message of Gracias a la Vida to their own lives. Students research Violeta Parra (google image search, general internet search, etc.) and share what they've learned. Then students listen to Gracias a la Vida (here you could use a cloze activity, using the Spanish lyrics and/or explore English translations of the song) - this song is POWERFUL for students! Mine remember this activity and remember the lyrics too. Students describe the message of the song (in writing or speaking with groups/partners). Students connect the song to what they are personally thankful for (could be a great writing prompt or discussion activity). #3 - Watch "Que linda manito"
Analyze this powerful short film starring Colombian actress Catalina Sandino Moreno, exploring the immigrant experience. This simple film (part of the films comprising Paris Je T'aime) reminds us of life's struggles and what we should truly be thankful for. Students will become familiar with the Spanish nursery rhyme "Que linda manito". Students will be able to express the positive and negative parts of the immigrant experience, connecting these ideas to themes depicted in the short film about a Colombian girl living in Paris. Here's how I used this activity with my 1st year high school students: Note it of course could be modified to be more/less challenging for other levels: We watched the short film twice (it is about 5 min long), then students wrote a journal entry of 150+ words (about a page) in English. How pretty and white this that God gave me. How pretty and black these that God gave me. How pretty and red this that God gave me. How pretty and chubby these that God gave me. 1. How does the scene when the girl sings to her own baby differ from the scene when she sings to the other baby? Discuss how the girl’s behavior differs and how film techniques differ. How do these differences give a window into the girl’s true feelings? 2. The girl is a symbol of the immigrant experience. What hardships does she have to overcome? Would you ever consider immigrating to another place? Discuss the pros and cons of doing so. 3. Over half of the film clip takes place in public transportation (the metro, bus, etc.). What other journeys do you imagine the girl has taken in her life? Discuss how for the girl travel may symbolize both a burden and an opportunity. Que linda manito movie clip from "Paris je t'aime"
Use this day for relaxed fun and games that use Spanish and help solidify a strong sense of team within your classroom. Tasks & Materials: Here are some easy and fun games for building classroom community, many of which use the target language. Each are described in detail in my previous post, Creating Good Vibes in Spanish Class. Sometimes even older students need a relaxing day making some good old fashioned turkey art. Task: "Glyphs" have become a popular way to integrate art and math in elementary classrooms, but I've found they have a place in the Spanish classroom too! Read this blog post of mine all about how glyphs can be used in Spanish class to get a better idea of what I mean. Basically, to make a glyph, students are given a key with set prompts that they use to create their own version of an art piece. Turkey glyphs like these are especially cute, make a great bulletin board, and are a great way for students to practice the target language. You can give them a Spanish language key, and students have to interpret the language in order to create their glyph. Check out my Turkey glyph activities on TpT or try making your own. Hope this list gave you a few ideas for those tricky days before the Thanksgiving break. Happy holidays to you all! You are so sweet with such a great ideas. Love the thank you treats from students to the teachers a lot. And one of my favorite Spanish singer Violeta Parra with "Gracias a la Vida" song. My best to you for the wife to be. as a first year spanish teacher i love your blog! thanks for all the helpful tips. your students are lucky to have a teacher as creative and hard working as you! I used the "Gracias a la Vida" lesson during a formal evaluation by my principal and it went so well! Catherine really helped me and took time to give me lots of ideas and it got great reviews! Thank you so much! I really appreciate you!